Well, if you haven't noticed, the combination of finals + winter break + not wanting to get out of bed has made me feel like a bum in terms of clothes. Very comfy, yes, but not very cute. Yesterday, though, we had a family reunion and so I finally wore something other than sweatpants and actually blow dried my hair, so I figured I'd share the top that I've been so excited to wear. Sadly, I don't have many other great pictures and this photo doesn't do it justice! I bought this shirt when I bought my tartan top at TJ Maxx! I have been lusting over peter pan collars but never found a top that I could really afford. My mom thought it was funny that I've been so obsessed with them because she wore them like crazy in college. Guess trends do come back, right? 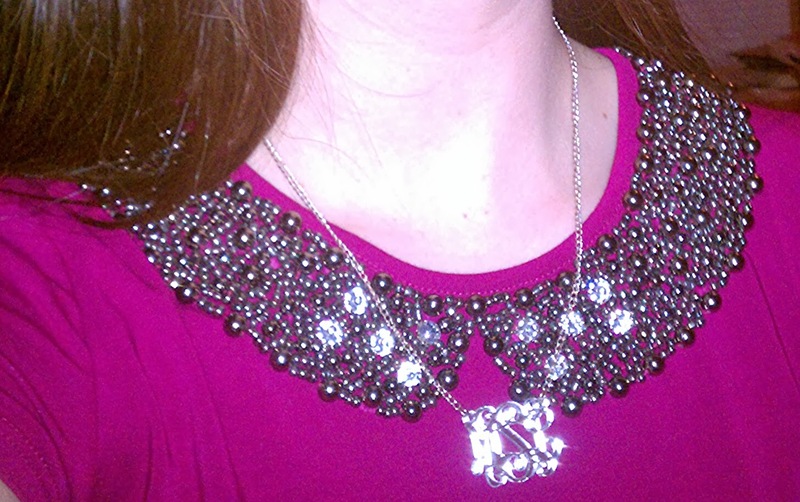 Anyway, it has this fabulous beaded collar on an extremely soft, fuschia short-sleeved top. It was so soft that I had to check and it's 55% cotton, 40% modal, and 5% spandex, in case anyone actually cares that much. As elaborate as the top is, I don't have a very elaborate fashion post, but I wore it with this skirt from Old Navy and that I've had forever (and with my treasured Etienne Aigner boots). But the rest of yesterday was lots of fun! I spent the morning and afternoon delivering monogrammed shirts to people and even though some would say it sounds boring, I really enjoy seeing and talking to people. I'd post a picture of all the shirts but so many are Christmas gifts that I don't want to ruin them! Travelling with Lilly makes it a little more fun! Here's my sweet brother rocking a Monogram Meredith frocket!